When installing a monobloc heat pump, one of the biggest issues is ensuring that valuable energy is not lost from the pipework as it exits the heat pump and enters the building. This run may be no more than a metre, but it is extremely important that only the highest quality insulation and flexible hoses are used. 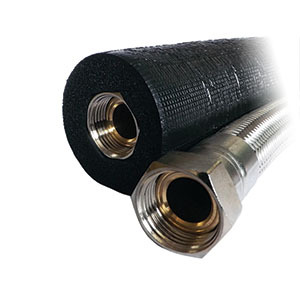 Poor insulation can considerably increase the running costs of an air source heat pump system. In order to limit these parasitic heat losses it is vitally important that high quality insulation from a trusted brand is used. 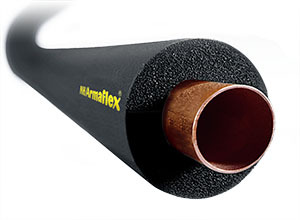 SOLFEX exclusively supply HT ARMAFLEX Foamed EPDM rubber insulation in many pipe sizes and thicknesses. hot pipework will be affected by cold bridging and heat loss if it is not insulated correctly. 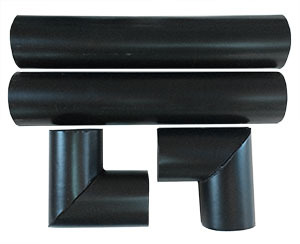 The Through Wall Kit provides both thermal insulation within the wall complete with elbow section to cover the copper connection. In order to ensure that small components are not the cause of negative perceptions towards the heat pump packs or SOLFEX in general, only the best Italian manufactured brassware is included in our packs. 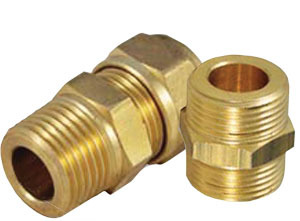 All brassware is manufactured to ensure the best possible seal.